At the Wall Street Journal, Jay Solomon reports North Korea was helping Syria build a plutonium-based nuclear reactor. Speculation about North Korea's alleged role was sparked by a September Israeli strike inside Syria, which targeted what many U.S. government and private analysts believe was a nascent nuclear reactor. This week, the Central Intelligence Agency is expected to begin briefing members of the Senate and House Intelligence Committees on the Israeli strike, according to Congressional and administration officials, based in part on intelligence provided by the Israeli government. Less conclusive, however, is any firm evidence that Syria was attempting to develop nuclear weapons, according to the U.S. official. This would seem to confirm what I posted last September -- about Israel attacking Syrian nuclear material and the North Korean involvement. This also justifies my long held skepticism about North Korea's so-called agreement to give up its nukes. Mr. Bush's action, which apparently caught congressional leaders off guard, centers on one provision in the legislation dealing with Iraqi assets. The legislation would permit plaintiffs' lawyers immediately to freeze Iraqi funds and would expose Iraq to "massive liability in lawsuits concerning the misdeeds of the Saddam Hussein regime," said White House spokesman Scott Stanzel. "The new democratic government of Iraq, during this crucial period of reconstruction, cannot afford to have its funds entangled in such lawsuits in the United States," Stanzel said in a statement. Congress passed the defense bill two weeks ago. The bill does not send money to the Pentagon, but authorizes $696 billion in military spending, including $189 billion for the wars in Iraq and Afghanistan, for the 2008 budget year. It aims to provide more help to troops returning from war and set conditions on contractors and pricey weapons programs. The bill would authorize a 3.5 percent pay raise for service members. It would also guarantee that combat veterans receive mental health evaluations within 30 days of their request and prohibit fee increases to the military's health care system. In one provision likely to be costly, troops returning from Iraq and Afghanistan are guaranteed three more years of Veterans Affairs health care after being discharged. The Democratic led Congress also used the bill to try and micro manage the nation's ballistic missile defense program. Congress authorized about $331 million less than requested for missile defense and restricted the money from being used to deploy missile defense radar in Poland and the Czech Republic until Congress received an independent assessment of the program. That's the way the Democratic led Congress punishes Russia for providing sophisticated air defense weapons to and Syria, not to mention providing nuclear fuel for 's Bushehr nuclear power facility. The Times of London reports that prior to the Israeli air raid on Syria's secret military compound near Dayr az-Zawr, Israeli commandos seized samples of nuclear material and laboratory analysis confirmed that the material was North Korean in origin. A note of caution here. One of the reporters, Uzi Mahnaimi, once reported that Israel was working on a bioweapon that would affect Arab genes only. According to the Times, Israel's attack on the “North Korean project” is part of a secret war against the weapons of mass destruction ambitions of the “axis of evil” - - Syria, North Korea and . Diplomats in North Korea and China said they believed a number of North Koreans were killed in the raid, noting that ballistic missile technicians and military scientists had been working for some time with the Syrians. Last week, Jane's Defence Weekly, reported dozens of ian engineers and 15 Syrian officers were killed in a July 23 explosion in Syria. According Jane's, a joint Syrian-ian team was attempting to mount a chemical warhead on a Scud missile when the explosion occurred, spreading lethal chemical agents, including sarin nerve gas. Syria's promise to to retaliate for the September 6 air raid is being taken seriously. Israel has made it clear that it will retaliate if it is attacked with weapons of mass destruction. Israel scrambled fighter jets toward Syria twice in the last few days. While Israelis were observing Yom Kippur, the holiest day in the Jewish calendar, police foiled a terrorist attack in Tel Aviv. The New York Times reports that John Bolton suggests that the Israeli strike vindicates his view that Syria is actively pursuing a nuclear program, which was at the center of the 2005 fight over his nomination of to become ambassador to the United Nations. The Israeli strike against Syria is a reminder that the "New Axis of Evil" remains a serious and determined group of state sponsors of terror. A fact which eludes the Democrats' Speaker of the House, Nancy Pelosi. More at Blue Crab Boulevard, Hot Air and Patterico's Pontifications. Remember those reports 10 days ago that Israeli aircraft had overflown Syria and were forced to drop fuel tanks and skedaddle when Syrian air defenses engaged the Israelis? Officials in Washington said that the most likely targets of the raid were weapons caches that Israel’s government believes has been sending the Lebanese militant group Hezbollah through Syria. and Syria are Hezbollah’s primary benefactors, and American intelligence officials say a steady flow of munitions from runs through Syria and into Lebanon. According to the New York Times, Israeli officials believe that North Korea is selling some of its nuclear material to and Syria. We’ve known for a long time that Syria has deadly chemical warheads on its Scuds, but Israel can’t live with a nuclear warhead. Syria has purchased between 60 and 120 Scud-C missiles from North Korea. The Israeli air strike again puts the world on notice that Israel will not dither indefinitely while the rest of the world watches diplomacy fail to solve the problem of terrorist states, such as and Syria pursue nuclear programs. The attack also demonstrates that the vaunted air defense systems Russia sold to Syria and aren't as effective as advertised. Is anyone else wondering if the Israeli attack was against Iraq's missing weapons of mass destruction? "It's a tacit reminder to Europe and to Washington that if they don't take a tougher action against , Israel may have to do it alone," says Avner Cohen, a nuclear expert and a senior fellow at the United States Institute for Peace. For Israel, the possibility of a nuclear-armed adversary might have been enough to warrant the operation. Officially in a state of war with Syria—and —Israel has vowed to let neither country obtain nukes (though Israel itself is believed to have built at least 200 nuclear bombs in its secret Dimona plant). Two detachable tanks from an Israeli fighter were found just over the Turkish border. According to Turkish military sources, they belonged to a Raam F15I - the newest generation of Israeli long-range bomber, which has a combat range of over 2,000km when equipped with the drop tanks. This would enable them to reach targets in , leading to speculation that it was an 'operation rehearsal' for a raid on Tehran's nuclear facilities. So Operation Orchard can be seen as a dry run, a raid using the same heavily modified long-range aircraft, procured specifically from the US with 's nuclear sites in mind. 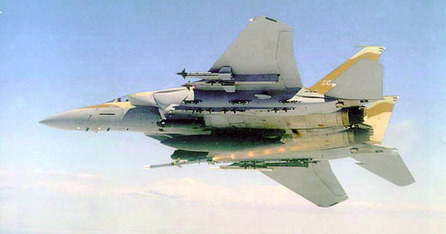 It reminds both and Syria of the supremacy of its aircraft and appears to be designed to deter Syria from getting involved in the event of a raid on - a reminder, if it were required, that if Israel's ground forces were humiliated in the second Lebanese war its airforce remains potent, powerful and unchallenged. At Captain's Quarters, Ed Morrissey writes that Syrian nukes would result in an immediate war with Israel which could involve the U.S.
Speaker Pelosi is too busy handing a diplomatic victory to Syria, one of the original members of the state sponsors of terrorism, to be bothered to send the war funding legislation to the president so it can be vetoed, allowing the Democrats to score a political points in the war they continue to fight, their war against President Bush. Syria’s assistance to terrorist organizations is well known, and the State Department continues to list Syria as a state sponsor of terrorism, in violation of resolutions on that issue by the United Nations Security Council. The Bekaa Valley in Lebanon, which Syria controls, provides a haven and the site of training facilities for Hezbollah, Hamas, and other terrorist groups. These activities could not occur without the assent of the Syrian government. The people of Israel and the cause of peace in the Middle East have been the traditional targets of the groups helped by Syria, but today’s attack on the U.S. convoy in Gaza is a reminder that the United States, and our interests around the world, are foremost on terrorist target lists. Dealing with the problem of terrorism must be our chief priority. One of the lessons learned thus far in the war on terrorism is that there can be no success without disrupting the support networks on which terrorists rely. Rhetoric has thus far not been effective in encouraging the Syrian government to cease its assistance to terrorists, and to remove its forces from Lebanon. Bush has said Pelosi's trip signals that the Assad government is part of the international mainstream when it is not. "A lot of people have gone to see President Assad ... and yet we haven't seen action. He hasn't responded," he told reporters soon after she arrived in Damascus Tuesday. "Sending delegations doesn't work. It's simply been counterproductive." The Financial Times reports Syria takes Pelosi's visit as a diplomtic coup, which the terrorists' supporters hailed as the "courageous position" taken by" Pelosi, being the highest ranking U.S. official to visit Syrian more than two years. The US and Europe cut off high-level contacts with Syria after the assassination of former Lebanon's prime minister Rafiq Hariri in February 2005. The UN is still investigating Syria's role in that murder. While Pelosi takes a break from legislating defeat in Iraq to provide a diplomatic coup to supporters of terrorism it has now been 58 days since President Bush sent the request for the necessary funds to support our troops fighting the war. When will the Democrats fund the war? According to the Associated Press, the purpose of the meeting is to discuss ways to maintain supplies to Hezbollah fighters with "ian arms flowing through Syrian territories." The AP cautions there was no mention of Larijani's travels in ian state-run media and the reports could be independently confirmed. Terrorism, whether it is al Qaeda flying airplanes into buildings filled with innocent civilians, the Taliban blowing up schools and police stations in Afghanistan, al Qaeda in Iraq blowing up civilians in Baghdad, al Qaeda trainees blowing up civilian trains in London or Mumbai, Palestinians in Gaza shooting rockets at civilian targets inside Israel, or Hezbollah attacking across Israel's northern border, killing and abducting Israeli soldiers and firing rockets at Israeli civilians, will not be defeated without peace in the Middle East between Israel and Palestinians. This issue, the case for a Palestinian state and the destruction of Israel, is translated by extremists into a battle between East and West, Muslim, Jew and Christian. Last night I reread British Prime Minister Tony Blair’s magnificent July 17, 2003 address to a joint session of Congress. There is much Blair said three years ago that should be remembered as we continue to prosecute the war against terror. Blair, reminded us that terrorism is spawned where there is no freedom, where many millions suffer under brutal dictatorships, living in unimaginable poverty nurtured by a fanatical strain of religious extremism. To eliminate terrorism, Muslims must be able to see Muslim nations still Muslim, but with some hope for the future, not shackled by tyrannical regimes whose principal victims are the very Muslims they pretended to protect. The Liberation of Afghanistan from the Taliban and the Iraq from Saddam's savage regime is the starting point for a new Middle East: Iraq, free and stable; and Syria, made to realize that the world will no longer countenance support for terrorism; the whole region helped toward democracy. And to symbolize it all, the creation of an independent, viable and democratic Palestinian state side by side with the state of Israel. We are fighting for the inalienable right of humankind--black or white, Christian or not, left, right or to be free, free to raise a family in love and hope, free to earn a living and be rewarded by your efforts, free not to bend your knee to any man in fear, free to be you so long as being you does not impair the freedom of others. This is why I continue to support the war against terror in Afghanistan, Iraq and now Israel's campaign against Hezbollah. A cease-fire in Lebanon is urgently wanted. But it should be a cease-fire under conditions where it can be lasting cease-fire and a step towards a lasting peace and victory over the conditions spawning terrorism. This requires that Hizbullah be reined in. Hizbullah's founding document calls for the destruction of the state of Israel. Hizbullah's record of terrorist attacks is long: the 1983 bombing of the barracks of U.S. Marines deployed peacekeepers in Beirut to keep the airport open for relief supplies; the bombing of the U.S. Beirut embassy in 1983 and 1984; the hijacking of TWA flight 847 and murder of U.S. Navy diver Robert Stethem in 1985; a series of attacks on Israeli targets in Lebanon; the bombing of the Israeli embassy in Argentina in 1992 and of a Buenos Aires Jewish community center in 1994. More recently, Hizbullah operatives have plotted to blow up the Israeli embassy in Thailand, and a Lebanese member of Hizbullah was indicted for helping to design the truck bomb that flattened the Khobar Towers U.S. military base in Saudi Arabia in 1996. Before September 11, 2001, Hizbullah was responsible for more American deaths than any other terrorist organization. Hassan Nasrallah, the group's secretary-general, recently proclaimed, "Death to America was, is, and will stay our slogan." The current "crises" stems from Hizbullah's unprovoked attack across Israel's northern border, killing and abducting Israeli soldiers. In 2004 the UN Security Council adopted Resolution 1559 calling upon Lebanon to disband the military wing of Hezbollah. In 2005, the UN Security Council adopted Resolution 1583 calling upon Lebanon to exercise its sole and effective authority throughout the south. Again this year the UN Security Council called on Lebanon to make more progress in controlling its territory and disbanding militias. Had Lebanon complied with the UN demands, the present crisis could have been avoided. The right approach in dealing with the campaign against Hezbollah's terrorism is to work for an urgent but enduring cease-fire in Lebanon, one that can deal with the causes of extremism that began this crisis and that can also lead to the establishment of the sovereignty of the Lebanese government throughout its territory. Anything short of that will simply encourage more violence in the long run. "We have concerns that they could be taken out of Lebanon to . Those concerns have a basis," said Foreign Ministry spokesman Mark Regev. He did not disclose the source of his information. This is one reason why Israel has imposed a naval blockade of Lebanon and attacked Beirut’s airport and two Lebanese army air bases near the Syrian border, even though Lebanon's military has operational fixed-wing aircraft . The lack of available airfields will make it more difficult for to assist Hezbollah.